I used to be so very proud of myself for being such a good multi-tasker and at some levels I still am. It is needed and valuable when the situation fits, but many times single tasking or “mindful” tasking is better. 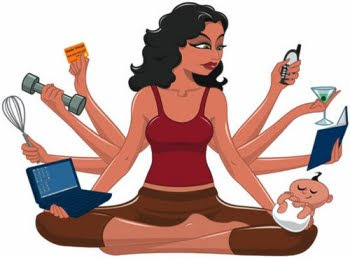 Our daily hectic life styles make if feel like we have to multi task. Lets take a look at both. 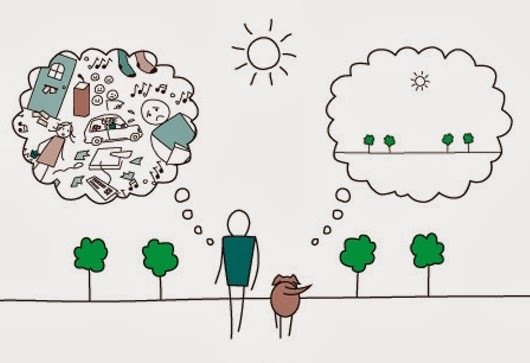 And then see how we may integrate these different approaches in our daily, realistic lives. Pros of Multi-Tasking: Ability to getting more done within a time frame. Potentially achieving more with the time you have. It can be a helpful tool if you are in certain emergency situations. Cons of Multi-Tasking: Not fully being able to focus and give full attention to something or someone. The risk of not doing something well, but only partially doing a task. Errors and mistakes increase the more you are multi-tasking. It can leave you feeling stressed, overwhelmed and not completely connected to the projects or people you are working with. You may find yourselves more blunt and less patient with others as you multi-task. What you do accomplish may not be your best. Pros of Single or “Mindful” Tasking: Giving your full attention to something or someone allows you to use your full intellect and emotions to accomplish what you want to do. Focusing on one thing at a time gives you the ability to give something or someone your best. Weather it is communicating with someone who you care about or completing an important task for your business. This full focus can allow you to potentially save time if this is your goal. Focusing on one thing at a time feels less stressful and more peaceful. Our bodies are not really intended to be in a “red alert” multi-task framework for long periods of time. Cons of Single or “Mindful” Tasking: You may feel you are not getting enough done. You have all this “stuff” going on and you are only doing one thing at a time. You may wonder am I doing all I can. At times you may feel you have no realistic choice but to be doing multi things at once. As I was writing this, it occurred to me, you can truly only do one thing at a time. It is HOW you choose to do each thing or interact with each person you have in front of you. You do have CHOICES as to how much time and focus you spend on something. And you do have a choice on which thing you focus on first. Yes there are some realities of performance on a job or making sure all the basics happen at your home or with your children. It may be at times you make a choice to spend less time on something and it be a bit less perfect. Or you may choose to take time for a conversation as you feel it is more important in the long run than something else you are working on. It is really all about choice and what you choose to focus on and for how long. And what you view as most important to you. As a therapist, I would have to weigh in on mindful single tasking as to relationships. Doing more than one thing at a time as you spend time with your partner or child normally does not work well. And of course there are exceptions. But in general without attention and focus, relationships suffer and problems develop. So in summary, my take on this issue is . . Decide each day what is most important and focus on that. Be ok with letting go of stuff that does not really matter. 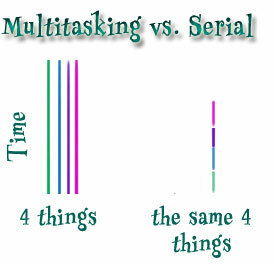 Multi-task when you must, but limit this to when it really has to happen. Do be MINDFUL or give full attention whenever you can. Remember your relationships will grow and strengthen with full attention and focus. Let your mind rest and “be with” whatever you have chosen to focus on, letting go of all the “other things” that are waiting on your “to do” list. Good luck in finding the best balance with how to manage your time for yourself, your professional life and your personal relationships. Keep in mind you are more than your “to do” list!